I’d say that Fedora has arrived! I’d burned two live CD’s — one of the current Fedora of the day, and one of the current Ubuntu of the day. I had wanted a group I belonged to to use one to reformat a virus-infected computer to use it again. Incidentally, they declined the honour, however that’s beyond my point: I didn’t want to give them (or anyone) the Fedora CD, while I thought that the Ubuntu CD was great out of the box, specifically including OpenOffice.org (now LibreOffice) and a cute little directory including a short video, a sample mortgage calculator, and two or three other little gems which really put the CD over the top for its immediate usefulness. Well, I haven’t really used Live CD’s much since I’m not all that worried about having linux on the run, but at this point Fedora 21 seems to only be available by Live CD’s. But to wit, the experience with Fedora 21 seems to be quite the improvement in experience, according to at least two of my somewhere between the stated and implicit standards of comparison: The inclusion of (now) LibreOffice, what I considered a killer omission, and the ability to quickly and easily install many “productive” pieces of software through the new software installer. To be fair, at the time Fedora limited itself to CD’s and in its efforts to include as wide a base as possible for supposed widest mass appeal, Fedora was unable to include OpenOffice.org (or, as possible, any usable subset thereof) due to space restrictions, although it was able to include AbiWord. Now, Fedora Workstation includes LibreOffice, and by typing into the seach box in the “Activities Overview” (click on “Activities” on the upper left hand corner of the screen, or invoke it using the “hot corner” by bringing your cursor up there), the installed software that may help you, as well as a number of other pieces of software in the repositories which may help you, as indicated by a little shopping bag to the left of the proposed piece of software. Well, well, Fedora 21 Workstation came out in early December, 2014 to (at least my) great anticipation. 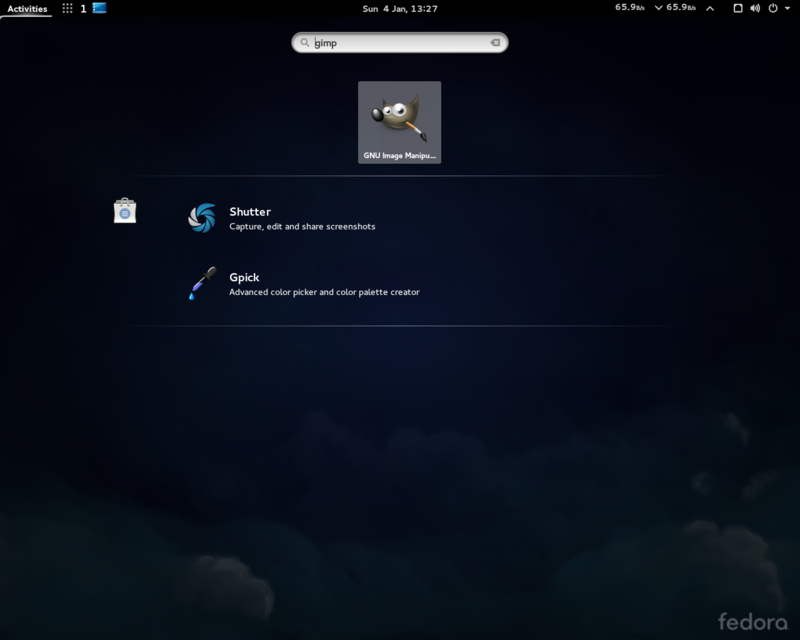 It works great, and it’s a nice evolution in the Fedora desktop. Initially, one of the biggest things that had me confused about it was wrapping my head around the hoopla: What’s the improvement? What’s the big deal? What has really come about to fill up the time between the release of Fedora 20 in December, 2013, and the release of Fedora 21 in December, 2014? Ok, tell me. “Uhhhh …” And so on. Eventually I understood, or at least presumed, rightly or wrongly, that the biggest improvements for me would be under the hood and I wouldn’t really notice much, although I’d see the better and more intuitive software installation manager on the gui, and the polish, which I have. Apparently — for (one of) the main (now) Products, the Workstation — improvements would show up in the clearing of many bugs, general issues, and polish issues, and as well as choosing “best of breed” components (and in some cases, working with or even creating some upstream projects expressly to make desired components into the “best of their breed”, at least toward Fedora’s new vision). This would be instead of Fedora giving the impression (again, rightly or wrongly) of just “throwing together a bunch of packages and compiling them into a distribution” (admittedly, that worked rather well, and by working with upstream projects directly to fix bugs and contribute desired new functionality.) And finally, the dimensions of the windows have been changed such that in many places, the gray space and borders are smaller and thinner. So after downloading and burning the 64-bit ISO (and concurrently, the 32-bit iso, the subject of Part II), and doing a full backup of my /home directory (including the hidden directories), I dived into the installation. I had no trouble at all installing F21 on my NEW NEW NEW Dell Inspiron Dell i3847-5387BK PC (Intel Core i5-4460 / 1TB HDD / 8GB RAM / Intel HD Graphics / Windows 8.1). Firstly, nuking the Windows install was a great pleasure after having been pestered into first installing the Windows 8.1 which came with the computer. And that’s not including all the really annoying and really invasive questions the install asks, like full names, areas, and connecting to your (or signing up for) Windows Live or whatever account (which of course I don’t have). The biggest thing that was a bit confusing was discerning in Anaconda the checkbox that allowed me to free up all space on the hard drive, given that it seemed to be slightly below the screen and I needed to scroll down to it. Once the basic information was input, the installation was great and quick; so quick, in fact, I neglected to enter a computer name — easily fixed with a “hostname (addnamehere)” and “nano /etc/sysconfig/network” as root and editing things appropriately. How pleasing to see that Windows *isn’t* listed. Now, beyond assuming that most linux distros pay the UEFI tax, err, registration fee, I wonder if Oracle pays it for Solaris, IBM for z/OS — I assume as much based on a cursory search for “IBM zos uefi” — or just about any other os developer working on intel architecture. After that, the computer ran (and of course still runs) great. I even described it as “frighteningly fast”. The new software installer in F21 is quite helpful in suggesting software I want if it’s not already installed, and installs it quickly. The best part is that it’s seamlessly integrated with the activities screen where I can enter software I want to use in the search line, and most of the uninstalled software that I’d want is listed. A few other command line installs were necessary though, to install (what my brother calls “your linux kung-fu”) some things like DenyHosts, some codecs, and so on. Well this solution didn’t seem to be persistent, even if the file is. I ended up going into the “settings” / “region and language” option of the gui and setting both the language and region to, surprise, surprise, Canada. Well this system is up and running, and works just like Fedora, surprise, surprise. My /home directory was restored with no trouble at all. And, while I was happy to have used Fedora 19 for a year and a half (as far as I’m concerned, Fedora heaven for me, getting an extra six months of system stability) I’m also glad to have updated to Fedora 21.